Chesire-based Pets At Home, the retailer of pet food, accessories and veterinary services, said on January 22 it may consider increasing its inventory holdings by up to £8 million as it “monitors” the Brexit process. Group revenue grew 6.3% to £237.2 million and the firm said its full-year results “remain in line with our expectations” and its financial guidance was reiterated. It expects group underlying profit before tax of £80 million to £85 million. 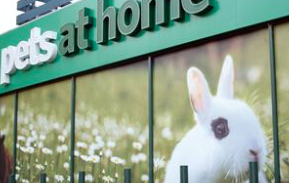 Pets At Home CEO Peter Pritchard said: “Momentum in retail accelerated over the festive period, culminating in the biggest trading day of our entire history on the Saturday before Christmas. “Our omnichannel business delivered exceptional performance, benefitting from investments made earlier in the year, including a new mobile website. “This resulted in 4.7% like-for-like growth in retail, an impressive 11% growth on a two year basis. “In such a challenging climate, this performance was only made possible through the hard work of our colleagues across the business. “We saw good customer revenue growth across our entire Vet Group. “In November, we reiterated the big opportunity to accelerate the maturity of our vet practices, but this needs to be achieved in a more sustainable way. “As such, I am particularly pleased with how the recalibration of the Vet Group is taking shape; the engagement from JVPs has been positive and we have made good progress in our discussions with buyback practices. “We also celebrated another milestone as we reached £10m raised for national and local animal charities through our VIP loyalty club since its launch in 2012, another fantastic achievement. “We are working closely across the group to maximise our assets and data as a pet care business, delivering initiatives that are resulting in an even better experience for customers.